Filipino protesters demand a stop to President Duterte’s war on drugs (AFP). Teresa had just unknowingly delivered her beloved nephew to his killers. Danilo is only one of the estimated 20,000 executed at the height of President Rodrigo Duterte Jr.’s ruthless war on drugs. From the moment he took oath in June 2016, the President went full rampage on the war that killed an average of 34 suspects per day, staying true to his campaign promise of combating illegal drugs through violence and bloodshed. 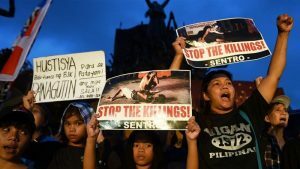 The state-sponsored killings, however, were selective and tended to target small-time suspects, later urging critics to label the phenomenon a “war against the poor”. While rich households were peacefully investigated for possible drug use, Danilo and other citizens like him were executed almost instantaneously, without regard to due process. The irony lies in the fact that, instead of targeting poor drug suspects, President Duterte ought to have focused his actions on poverty reduction in order to alleviate drug abuse. “This drug problem only occurs due to poverty… Some of the [victims] sold drugs because they do not have other means of livelihood,” Teresa argued. Teresa laments the fact that Danilo, along with other extra-judicial killings (EJK) victims, were not given their chance at rehabilitation. As some drug users who turned themselves in for fear of being killed are now under the drug war’s “second phase”—which involves the rehabilitation of around 700,000 drug users and is a rather positive outcome of the campaign—her nephew was not as lucky. While the Duterte regime prided itself with the slogan “change is coming”, change for Danilo is no more. “He [Pres. Duterte] promised change. I hope [the victims] were given the chance to change. They [the police] have no right to take someone else’s life,” Teresa said. In a late 2017 statement, President Duterte has pulled out the Philippine police from his brutal drug war, signaling a slow demise for the bloody crackdown operations. But for Danilo, who was executed in December 2016—more than two years ago—justice is still nowhere to be found. As if resigned to their fate, Teresa said she does not have any plans to file a case against the officers who murdered her nephew. “[The police] told me they killed [Danilo]… that he is already dead. At first, I even thought they were kidding,” Teresa recalled. “I don’t have any more hope, and besides, they might also murder me,” she added. Teresa still calls for the summary executions to be put to a halt. With thousands of lives lost, a clear international regime condemning the killings has yet to come to action. Sooner or later, all these deaths would be forgotten, and the phenomenon would simply go down in history as yet another failed attempt at an anti-drug campaign—as if lessons were never learned from the case of Thailand, where a similar operation in the early 2000s resulted in about 2,500 deaths. But as the crackdown mellows down, and as President Duterte’s apparent addiction to mitigating drug addiction reach its final moments, may the international community continue to flame the hope that has already escaped Teresa and the thousands of other families whose loved ones have been taken away. If world leaders are turning a blind eye towards these heinous crimes, may civilians beg to differ. Along with the thousands of human rights advocates, youth groups, and religious communities in the Philippines who rallied against the drug war, may the international community’s call for government accountability continue to reverberate until justice is finally served. Note: Special thanks go to Mr. Ralph Uyan Alayon Obina, who granted the author exclusive rights to use his audio interview with Teresa (not her real name) for this article.